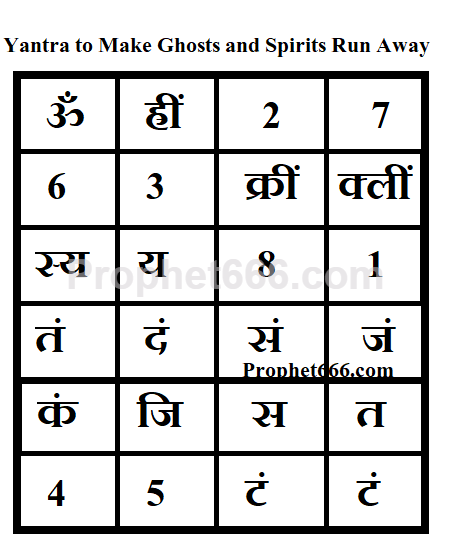 This ghostly being repulsing Yantra is a standalone talisman, which is prepared using a combination of unique numbers and letters that cumulatively vibrate to a specific frequency, which is said to repulse and remove ghosts and similar entities from the surroundings of the practitioner and stop or prevent them from bothering him. 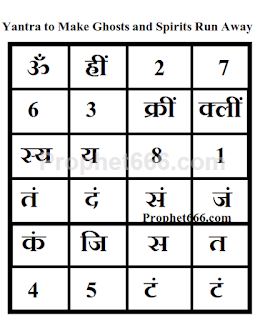 The best thing about this Ghosts and Spirits repulsing Yantra is that it is free from any kind of infusion or energization procedure for activating it for actual use, which is the removal of ghosts and spirits from the vicinity of the practitioner. Another good thing about this Yantra is that it can be written with any kind of ink, like blue, black or red on white colored paper and it does not need to be worshiped nor do any special offering have to be made to this Yantra. This can be done on any day and there is no need to wait for any auspicious occasion for making or using this Yantra. It can be kept in the pocket, purse or inserted in a cloth or metal locket and worn around the neck or the right wrist of the practitioner. Every yantra or sadhana that you tell is for businessmen and shop owners and those who have lockers and safes. Everyone of us do not have lockers and safes where we keep money. We are not that rich. Please tell sadhanas for people like us who work and earn less.